Networking Builds Community Business Expo – We’ll Be There! J.H. Rudolph & Co., Inc. is excited to participate in Networking Builds Community Business Expo to be held on Saturday, March 31 from 10:00 am to 6:00 pm (CST) in Evansville at Washington Square Mall. This event was created to bring businesses and our community together to raise awareness and money for four area not-for-profits, as well provide participating business an opportunity tonetwork with other businesses and the general public. The event is FREE to attend and will feature a Live Auction, FREE Zumba Class, Raffle Prizes, Guest Speakers, Activities for Kids, a Scavenger Hunt, Giveaways and Business to Business Networking. Over 50 businesses have signed up to participate and host a booth, many with raffle prizes and giveaways. Check it out and visit the J.H. Rudolph & Co., Inc. booth located inside Washington Square Mall on Saturday, March 31 from 10:00 am to 6:00 pm (CST)! The Jasper Chamber of Commerce 2012 Home Expo will be held Saturday, March 24 and Sunday, March 25 at the St. Joseph Chruch Parish Center (behind the church near the corner of 13th and Newton streets) in Jasper, Indiana. The Expo opens at 9:00 am (EST) and goes until 4:00 pm (EST) on Saturday and runs from 11:00 am (EST) until 3:00 pm (EST) on Sunday. The Expo features over 50 booths and admission is FREE. Come check out our booth and find out more about beautiful, long-lasting asphalt driveways paved by J.H. Rudolph & Co., Inc.! Visit the J.H. Rudolph & Co., Inc. boothF-217 in the Ford Center at the Evansville Courier & Press and Heritage Federal Credit Union Home Show on Saturday, March 17 and Sunday, March 18 from 9:00 am to 6:00 pm each day. J.H. Rudolph’s booth will highlight our Driveway Paving and Light Commercial divisions, providing homeowners and business owners insightful information on the services we offer in asphalt and concrete paving and how we can be a partner in creating a long-lasting, curb-appealing driving surface for many years to come. The Home Show will host over 250 exhibit booths in The Ford Center and The Centre and feature many speacial show guests like Vern Yip from HGTV’s Design Star and Frank Fontana from HGTV’s Design on a Dime. Spencer County Habitat for Humanity was excited to announce last summer that Sean Appel and his family would be receiving one of two homes the organization would build in 2011. This home would be built for Sean, his wife Kassandra and their two very special little girls, Alex and Zoe. Another special person in their family, Fran McKasson, A/P Clerk & Grandmother to Alex and Zoe, was excited as well! Fran kept many of us up to date on the progress of the home build and gave employees the opportunity to help build Sean’s home. 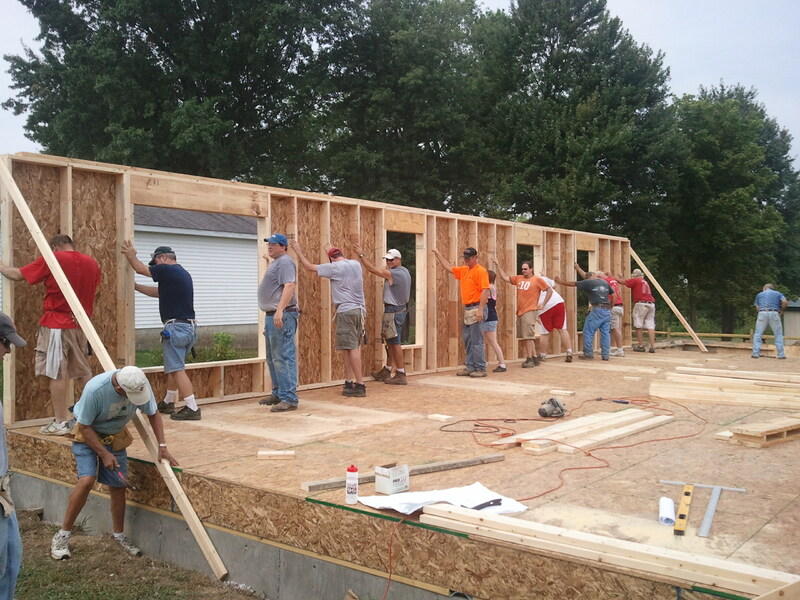 Jeff Kline, Project Manager, was able to make it to the site one Saturday morning to help raise the walls of the home. Thank you to Jeff for volunteering and Paving It Forward – J.H. Rudolph style! You are currently browsing the J.H. Rudolph and Co., Inc. blog archives for March, 2012.